SAN JOSE, Calif.--(BUSINESS WIRE)--Nov. 30, 2016-- Federal Realty Investment Trust (NYSE:FRT) announced the start of construction today on 700 Santana Row, a 284,000 square-foot office building set on a signature plaza with a sweeping design that anchors the end of Santana Row, Silicon Valley’s iconic mixed-use neighborhood. 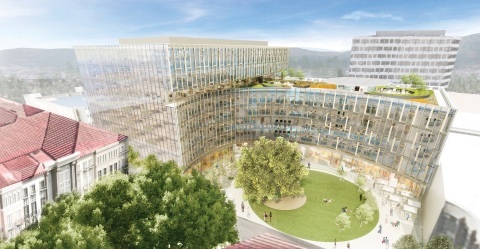 The state-of-the-art, eight-story structure at Santana Row at Olsen Drive features 30,000 and 48,000 square-foot floorplates, modern architecture and headquarters-quality office space with concrete construction, which gives the building distinctive design qualities compared to traditional Silicon Valley office buildings. 700 Santana Row follows the highly successful 500 Santana Row, a six-story office building on an adjacent site fully-leased to Splunk Inc. in 2015 with occupancy slated to begin next month. Ready for tenant build-out in the third quarter of 2018, 700 Santana Row will also feature a three-per-thousand dedicated parking ratio and a 15,000 square-foot roof-top terrace and garden with majestic views of Santana Row, the San Jose skyline and distant foothills. Shuttle service will take Santana Row office tenants to nearby Diridon Station for Caltrain and VTA light rail service. “The on-site amenities and walkable environment that Santana Row offers has become a recruiting and retention tool for Splunk, Experian, Si-Bone and the other companies located here,” said Jeff Berkes, President-West Coast for Federal Realty Investment Trust. Newmark Cornish & Carey is the leasing agent for the project. 700 Santana Row has been designed by WRNS Studio of San Francisco, and Devcon Construction is the general contractor. Santana Row’s world-class amenities include 50 shops, 30 restaurants, a 215-room boutique hotel offering extensive full service conference facilities, two parks and multiple plazas with outdoor seating and free wifi, 615 rental homes and 219 privately owned condominiums. For more information on leasing at 700 Santana Row, contact Randy Gabrielson, Todd Shaffer, or Tracey Solari of Newmark Cornish & Carey at 408.727.9600 or visit http://theofficesatsr.com/building/700-offices/.